As of yesterday this blogs run WordPress 2.7 and this worthless information wouldn’t have ever reached a post unless it broke something. And it did. Right after upgrading I happily did post on Process Monitor but couldn’t publish it. Windows Live Writer (WLW) started throwing me error mentioning blogger.getUsersBlogs method. Not that self-hosted WordPress has something to do with Blogger, right? Trying to upgrade my account in WLW settings didn’t work either, giving variation of same error. Did me no good with WLW and crashed my whole blog instead. directory. 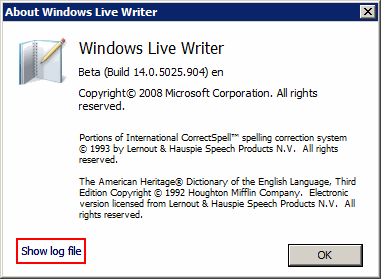 It is also quickly reachable from Help > About Windows Live Writer menu. Quick check on FTP showed that instead of class-IXR.php I had class-ixr.php in my wp-includes folder. Which are different things under Linux hosting because case in file names matters there (unlike in Windows environment). File renamed, case solved. Sometimes those answers are not the right ones. I wish world stick to lowercase for PHP filenames. i have the problem even when the name of file is correct .. Sorry, this is quite an old post and I never had this issue since or encountered new info on it. This might make a good question at http://wordpress.stackexchange.com/ if you are sure issue is with your blog and not LiveWriter itself.